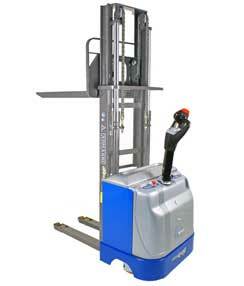 MAX is the lift truck that best expresses the concepts of robustness and power; designed and manufactured with special structure and materials, it can be used to move heavy and extra-heavy loads in total safety conditions. With the different versions available MAX , it is possible to deal with nominal capacities ranging from 1300 to 2000 Kg with excellent residual capacities ensured up to lifting heights of 3.5 metres. Extruded masts with special steel profiles and specific manufacturing characteristics such as the extra-heavy structure of the legs on the ground and of the forks ensures maximum levels of stability and capacity; ideal characteristics for high capacities and use in difficult activities. Thanks to this quality, the Max model is the most suitable machine to be used with special tools or forks for heavy loads at particularly demanding centres.